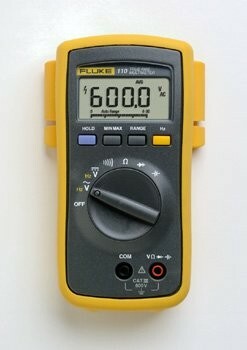 The Fluke 110 Series offers professional users a versatile meter for accurate troubleshooting. True-rms ac voltage and current readings, for example. 6000 count resolution. Min/Max/Average. And frequency and capacitance capabilities. Frequency, capacitance & resistance capabilities. 3-year warranty. 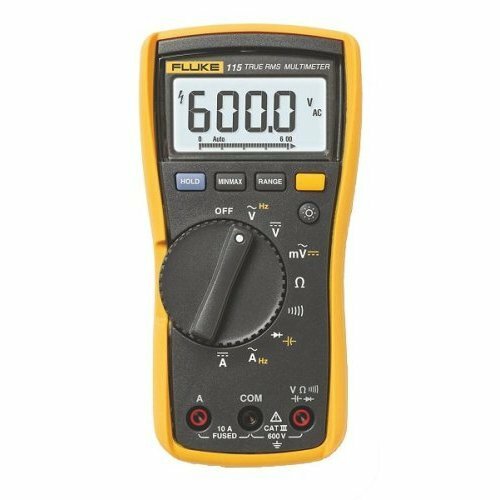 The Fluke 115 is the solution for a wide variety of electrical and electronic testing applications. True-rms for accurate measurements on non-linear loads. Min/Max/Average with elapsed time to record signal fluctuations. Measures 20 A Resistance, continuity, frequency, capacitance, and diode test. Industrial digital multimeter. 6000 count display provides improved resolution. True-rms ac voltage and current for accurate readings on all waveforms. Min/Max/Average recording; frequency, capacitance & resistance capabilities. It has a backlight to illuminate the screen in dark workspaces. 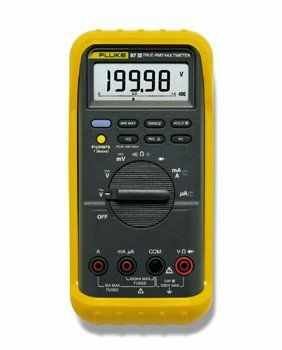 Totally Sealed Digital Multimeter - Combines accurate digital and analog measurement capability. Spec. MIL-STD-28800 for style A, Class 2 instruments. 3200 count display; 31 segment analog bar graph; autoranging; Conductance for high resistance measurements; Min/Max. Large 50,000 count, 1/4 VGA display with a white backlight. Stores up to 15,000 recorded events. Real time clock for automatic time stamping of saved readings. Low impedance voltage function prevents false readings due to ghost voltage. 0.0915% basic DC accuracy; All standard DMM functions: AC Volts; DC Volts; Ohms; Diode Test; Auto and Manual Reading; Continuity; MIN/MAX/Average; Auto Hold and Manual Hold; Capacitance, resistance, frequency and temperature measurements. Volts, Ohms, 10A and mA current, diode test, continuity beeper All inputs, ranges and functions protected to 600V CAT III and 1000V CAT II Protected from overvoltage transients to 6 kV pre IEC 1010-1 0.3% basic accuracy Rugged overmolded case Large LCD. Cost Plus Tools offers auto mechanic tools guaranteed to get the job done right. The Fluke 88V has improved measurement functions, trouble- shooting features and accuracy to solve more problems on conventional and hybrid vehicles. In addition to having all standard multimeter features like the ability to measure voltage, current, continuity, and resistance, the 88V can perform diode test and pulse width measurements. This meter can take current measurements up to 20A for 30 seconds and 10A continuously. The Precision Series of precision multimeters are designed for the most demanding applications. Basic DCV accuracy of 0.02% demonstrates the accuracy and resolution that is carried through all the measurement functions. Special features include adjustable trigger level in the Frequency function (5Hz to 2MHz). Capacitance Range 50nF to 999μF. Smart Auto Power Off, fast Continuity test, Relative, Hold and Peak Capture. Auto Power Off, Max/Min, PC Interface. Three year warranty. 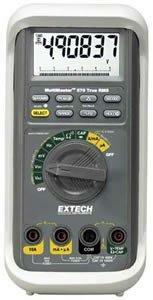 Extech MultiPro professional multimeters. High performance autoranging digital multimeters. 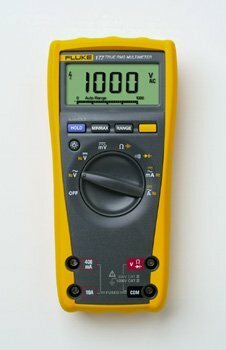 Measurement functions include AC/DC voltage and current, resistance, frequency, capacitance, diode and continuity. Complete with built in stand, CAT III test leads, protective holder, 9v battery and temperature probe. High basic DC voltage accuracy of 0.08%. Wide AC voltage bandwith of 40 Hz to 20 kHz. Backlit 5000 count LCS display for high resolution.